Every now and then, something happens that makes you feel old. And yes, I’m aware that at only 25, I have no room to talk because I am not anywhere near old. However, after reading this book, I realize that I’m getting closer. 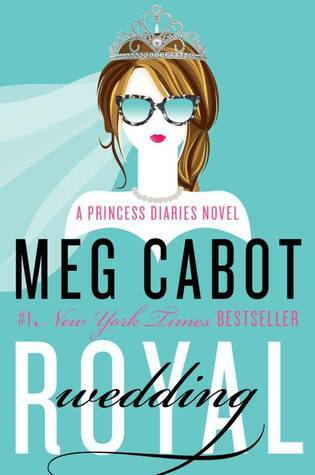 Meg Cabot’s The Princess Diaries series is one of my all-time favorites, and 15 years have passed since its debut. 15 YEARS! Much like my experience with Harry Potter, I have literally grown up alongside Amelia Mignonette Grimaldi Thermopolis Renaldo, Princess of Genovia–otherwise known as Mia. In Royal Wedding, the 11th installment of the series, Mia has quite a lot going on in her already hectic life. She’s turning 26 and is finally engaged to her high school sweetheart Michael Moscovitz, but planning a wedding proves much more difficult than expected when she also has to run a non-profit, avoid the paparazzi, and help her father win the Genovian election for prime minister. Oh, and speaking of her dad, it just so happens that Mia has a long-lost half-sister. I was thinking of adding a spoiler alert disclaimer to this review, but Cabot can’t exactly keep this plot twist a secret when she’s also recently published From the Notebooks of a Middle School Princess, a children’s book starring Mia’s new sibling, Olivia Grace. And honestly, the appearance of Olivia isn’t even the biggest surprise in this book, but I’ll keep quiet on those particular details. That’s the exact problem that I have with Royal Wedding–it packs so much in one novel that it’s difficult to savor each development. By the time you adjust to a new change to these characters, you’re bombarded with yet another. There hasn’t been a Princess Diaries book in six years, and it would have been nice if readers could have experienced more gradual exposure rather than become overwhelmed all at once. It’s also worth pointing out the a third Princess Diaries movie is rumored to hit theaters in the future, although nothing is in development at this time. Considering that the second movie, “Royal Engagement” (2004), diverted completely from the books by depicting a 21-year-old Mia becoming Queen and betrothed to someone other than Michael, I’m not sure whether the movie will be an original adaptation, a reboot, or something different (if it’s made at all). I’m actually hoping that if Disney pursues a third movie, it will feature Olivia, because then a new generation call fall in love with the Princess Diaries. And since the 12-year-old is half-black, it would be great to see more characters of color on-screen. Ultimately, though, after 15 years, dare I say that I’m getting a little tired of Mia? I rapidly lose interest after the ‘happily ever after,’ and I have no real desire to see her in all her domestic bliss. Don’t get me wrong: Royal Wedding is an entertaining addition to the series, and despite its flaws, I still gobbled it up in about a week. Meg Cabot is a wonderful writer, and I will remain a devoted fan no matter what. But if it’s up to me, I declare–bring on the new princess! This entry was posted in Book Review and tagged book review, Meg Cabot, Princess Diaries, Royal Wedding by Book Club Babe. Bookmark the permalink.